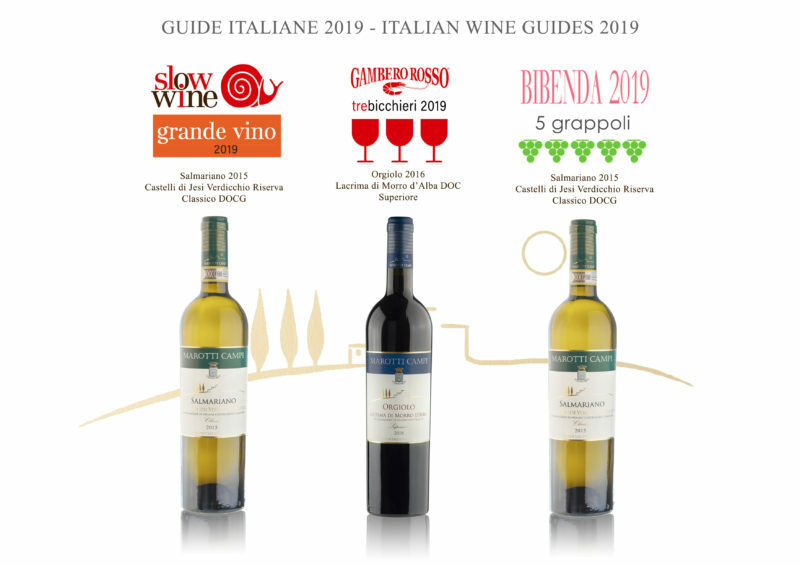 Now that the main Italian wine guides published the awards 2019 winners we can consider ourselves happy and proud for another great year of achievements. Our Verdicchio Riserva Salmariano 2015 has been awarded both “Great Wine” from Slow Wine and 5/5 Grapes Bibenda but the Tre Glasses Gambero Rosso this year goes to Orgiolo Lacrima Superiore 2016 that made it several times in the finals. Being the very first time for the Lacrima DOC appellation we are even more proud. The wines of Le Marche have reached a very high level and the quality is getting higher and higher year after year. Today we celebrate, but the team of our precious workers is already at work to make the next vintages even better because we know that our friends and neighbours are doing the same. Ora che le principali guide Italiane hanno pubblicato I premi del 2019 ci sentiamo felici ed orgogliosi per un nuovo grande anno di riconoscimenti. Il nostro Verdicchio Riserva Salmariano 2015 è stato premiato “Grande Vino” da Slow Wine e 5/5 Grappoli Bibenda, il Tre Bicchieri Gambero Rosso questa volta è andato all’Orgiolo Lacrima Superiore 2016 più volte arrivato in finale. La cosa ci rende ancora più orgogliosi essendo la prima volta per la DOC Lacrima. I vini delle Marche hanno raggiunto un livello qualitativo molto elevato e crescono ogni anno. Oggi festeggiamo ma il team dei nostri prezioni lavoratori è già all’opera per rendere le prossime vendemmie ancora più buone perchè sappiamo che i nostri amici e vicini produttori stanno facendo lo stesso.